eradicate tuberculosis [Credit: gmpicket, flickr.com]. From the ninth floor of the new Smillow Research Center in New York City, you get a great view of Roosevelt Island, the narrow strip of land that sits in the middle of the city’s East River. If you look closely at the island’s tip, you can see a dark, dilapidated building that hasn’t been used for years. 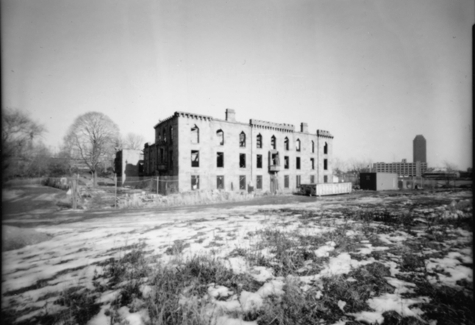 This relic is what remains of New York’s smallpox hospital. Dr. Joel Ernst, a tuberculosis researcher, draws inspiration from this building. To him, it represents a success story in the history of infectious disease treatment — smallpox is now almost completely eradicated. Ernst hopes that through future research, including his own, tuberculosis will one day be what smallpox is now: a remnant of the past. In order to tackle this persistent disease, which is caused by the bacterium Mycobacterium tuberculosis, researchers are probing into TB’s biology and trying to figure out the mechanisms behind its harmful, and in many ways deceitful, actions. Ernst’s lab has made some crucial findings on how the immune system, the body’s natural defense against foreign invaders, responds initially to a tuberculosis infection and where in the body the bacteria hides in this early stage. Learning more about these primary events will help scientists better understand the enemy and may bring them steps closer to an effective prevention. While tuberculosis is an ancient disease — there is evidence that Egyptians fell victim to the bacteria in 3000 B.C. — today it remains far from eradicated. About one-third of the global population, or two billion people, is infected with the disease, and about two million die from it each year, according to the World Health Organization. And even though a TB vaccine, known as the BCG vaccine, has existed for more than 80 years, its efficacy varies; some studies show a high level of protection, while others show none. One reason it’s hard to make an effective TB vaccine, says Ernst, may be because the bacterium does a terribly good job of evading the immune system and using its defenses to the bacteria’s advantage. When a person inhales droplets containing M. tuberculosis, the bacteria find their way to the lung cells. Here they hide inside the immune cells — the very cells that are meant to defend your body. However, the immune system does not respond right away, partly because the bacteria are manipulating the immune cells so that they do not see the infection. It can take one to two weeks for your body to recognize that there is a pathogen present and send out cells to fight it. This delayed reaction “allows the bacteria to grow and really define its own little environment,” says Andrea M. Cooper, a tuberculosis researcher at the Trudeau Institute in Saranac Lake, N.Y.
Scientists previously thought that once the bacteria migrate to the host’s lungs, they primarily take up residence in macrophages — immune cells that help gobble up and dispose of harmful organisms. However, Ernst and his colleagues found in animal studies that M. tuberculosis mainly infects a different type of immune cell, called dendritic cells, in the lungs. While it still needs to be confirmed in humans, this finding took the field in a new direction, says Ernst. “Now that we know that dendritic cells get infected, we can begin to broaden our studies and ask, how does Mycobacterium tuberculosis perturb dendritic cell functions as well as perturbing macrophage functions?” he says. The lab published their work in the Journal of Immunology in August 2007. In addition, the researchers found that dendritic cells transport the bacteria to the lung-draining lymph nodes, and it is only once the infected dendritic cells reach the lymph nodes that a full immune response is activated. The researchers suspect that M. tuberculosis slows down the dendritic cell migration and thus delays the immune response. Although previous research indicated that dendritic cells are important players in the early stages of TB and that they migrate from the lungs to the lymph nodes, Ernst’s lab was the first to demonstrate these results using live tuberculosis bacteria. Also, their work was performed in vivo — they infected mice by having the rodents inhale the bacteria, just like what would happen in people, and monitored how the disease progressed over several weeks. Using bacteria that were labeled with a green fluorescent protein, the researchers were able to quantify the different types of cells that are infected with TB and track those cells over time. This careful quantification made the work of Ernst’s lab “more elegant in some ways” than previous research, says Padmini Salgame, an immunologist and tuberculosis researcher at the University of Medicine and Dentistry of New Jersey, whose 2004 paper highlighted the importance of the dendritic cell response during initial TB infection. For now, scientists continue searching for answers that may aid in the disease’s eradication. Why isn’t there an HIV vaccine? A bacterial product could give rise to a new malaria drug.